Sign up to Print a coupon for a free appetizer or dessert with the purchase of two adult dinner entrees at a participating Longhorn Steakhouse near you. With the purchase of two adult entrees. Printable Coupon: Enjoy $10 off your meal purchases over $50, excludes alcohol, taxes, and tips. 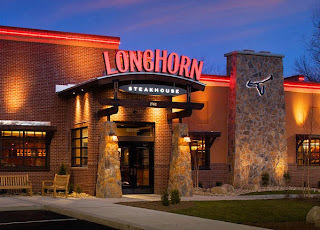 Purchase one lunch combination and receive a 50% discount on a second one of equal or lesser value at a Longhorn Steakhouse near you. Dine-in only.